Following up on my post around Blackberry data useage found here. It has now been a week of monitoring my data useage on my Blackberry Bold 9000. Details around my typical useage can be found in the original post so I won’t repeat those here. Needless to say, I am probably a fairly atypical user and certainly on the higher end of useage. As mentioned last time, I installed David from the Blackberry Appstore so I could monitor my data useage. In the week that has passed my average has been around just over 10 megabytes of data a day. So this would average out to just over 300-320 megabytes for the month. So back to the 3 easy steps to see if I could get a different answer. Tried a few other options, same result. Vodacom clearly doesn’t want me to buy 300Meg a month. I browsed around the site but still couldn’t find the price. How hard is it to tell your customers what options there are and how much they would be ? I did find the Blackberry BIS service price which was R59 a month (prepaid). (No link sorry, their website seems to produce session specific links so had to remove it). 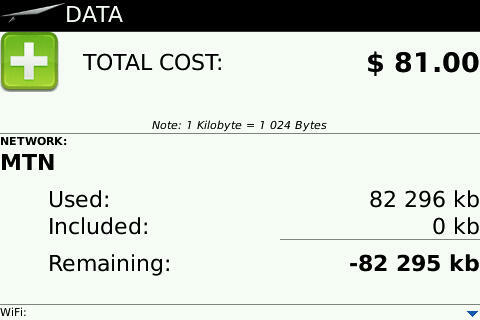 Try www.vodacom.co.za and let me know if you find the data prices quicker than I did. MTN was a little easier. I quickly found their data options and an “Extended Data 350″ option which gave the required data amount for R209 a month. That though i then discovered was a complete contract not a bolt on to an existing contract. They have a 300Meg option for the grand price of R149 a month. Not too bad and not too hard to find. So with some very poor maths and mixing and matching between service providers, it would seem that if I was paying for my data useage on the optimum data contract would cost me R149 a month rather than the Blackberry cost of R59 a month, an additional monthly cost of R90. Is it any wonder then that people, and particularly teens are going for the Blackberry option? They generally like to use Facebook, Mxit, and are increasingly discovering the joys of a service guaranteed messenger in Blackberry messenger. I fully expect Blackberry to continue to grow from strength to strength, and really hope that the other providers come out with some kind of competitive option. Increasingly other phones are coming bundled with a small data package, but, 30 Meg of data on an Android device (Bundle with SE X10 Mini) really doesn’t cut it, and can easily be used in an hour at the park. In summary then, people often ask how good a deal is the Blackberry with unlimited data? Extremely good value for money is the short answer. I have been curious about Blackberry data useage for a while. The Blackberry contracts (BIS/BES) are around R65/month and include unlimited data for on-device browsing, email, IM, etc. I do a fair amount of browsing on my Blackberry (rather than my Nokia) largely because of the data. I have a small (30 Meg) data bundle on the Nokia and I regularly go over the limit. Not difficult to do given that some web pages (even on the mobile device) take a few hundred K, making it every easy to use a Meg or two reading just a few sites. The other factor is that Blackberry is said to use a fair degree of compression through the use of their own data proxies and their own services. So how much value for money do I really get out of the Blackberry service? I looked around for a tool to monitor the useage, and came across a few, but only one seemed as though it would be up to the task, so I downloaded “David” from the blackberry appstore. It is a 60 day trial version, but is more than adequate for monitoring a few days useage. Two days useage +- 18 Meg (and after the 1st day it was around 9 Meg). That includes Twitter, Facebook, Linked In, downloading some apps, browsing the net, BB Messenger etc. I am really impressed with the relatively low data useage given my patterns of useage. Anyhow, some very quick sums and it would be around 270 megabytes of data per month. For the price paid for the BIS/BES useage, that is really good value for money. I’m probably an outlier on useage, though perhaps not in the top 2% of users. Still, for anybody looking to make decent useage of their mobile device and not to have to worry about crazy high bills, the Blackberry with “uncapped” data useage is a really good deal. BB Messenger also works a good deal better than MXit, they way its integrated into the device and has message delivery and read statuses. No more messages lost in the ether. I’m interested in hearing about other people’s useage patterns and their thoughts on the Blackberry data bundle and value for money.